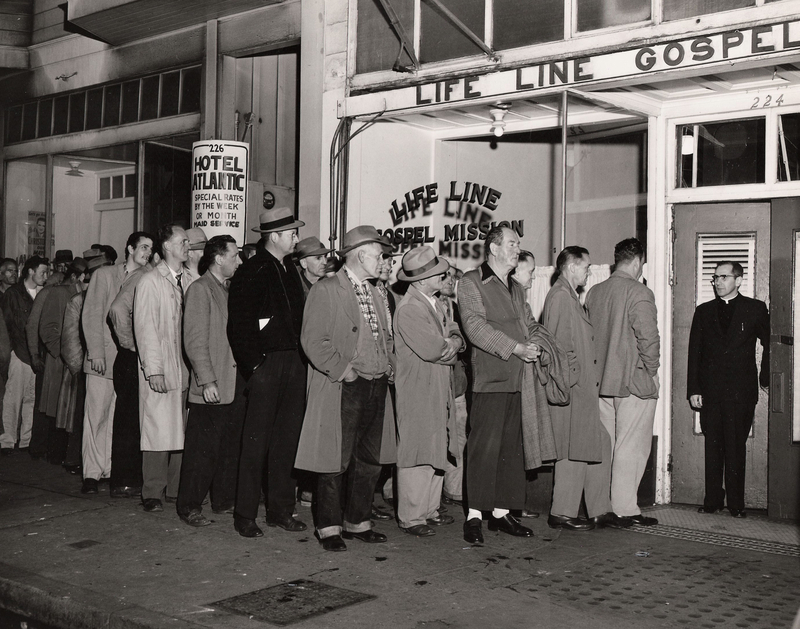 Today’s Photo Friday celebrates the Brethren in Christ involvement in city missions with a focus on the Life Line Gospel Mission, an urban mission station established in San Francisco, California, a century ago. One of my final papers for this semester of grad school will focus on a topic relevant to Brethren in Christ studies: the urban mission movement. As but one of the religious groups that established mission stations and city congregations in the late 19th century, the Brethren in Christ stood alongside denominations like the Salvation Army, the Nazarenes, and the Southern Baptists, who also demonstrated interest in urban evangelism and social reform. After the jump: Read more about the church’s urban mission movement, and see more images of the San Francisco Mission. 2. All photos courtesy of the Brethren in Christ Historical Library and Archives. I notice most of the men in the photos wear suit coats or jackets. In some men and women wear outdoor coats, so this practice may have been related to the prevailing weather. However, the young boys in the VBS photo also wear suit coats or jackets. I notice the obviously hungry individual in the food line has already taken a bit of the sandwich even before his serving is completed. What a great opportunity for so many years for the church to demonstrate caring compassion. Matthew 25:40. Thanks for the observations, David. It would be quite interesting to study the logs from these missions (in San Francisco and elsewhere) and get some sense of the population with which these missionaries worked. I think we tend to imagine them as significantly poor (which many certainly were) and white (Wittlinger says as much in Quest for Piety and Obedience), but these photographs suggest a more nuanced analysis is necessary. The little bit of reading I have done seems to imply that the mission workers themselves had a particular image of the people to whom they ministered. Would be interested to see how these kinds of conceptions shaped their ministry approach. Our congregation at Harrisburg BIC Church is committed to the vision of being a church in the city as well as being made up of people from many cultures. My husband and I joined this congregation as college students, almost 40 years ago, because we had a desire to be part of a city church. This congregation is one of the few that started as a mission outreach (Bailey Street Mission staffed by mission workers, and it was a largely white congregation and children’s ministries). They later moved to a different part of the city on Allison Hill (Bellevue Park BIC Church — later changed name to Harrisburg BIC when the Messiah Home Chapel congregation joined up with us). When we outgrew that location, the decision had to be made again: would we sell and move to the suburbs and build? Or stay in the city and seek to find a large building, one that could be remodeled into a church building with may functions. A few years ago we moved into our present building on Derry Street, a former car dealership that needed a LOT of remodeling! It is interesting that some of the original mission workers still are part of our congregation (Paul and Ethel Bigham) and Beulah Lyons lives now at Messiah Village. They have stories to tell! Interesting. A careful look shows that these men are indeed needy. But many of the transients seen today in the general public areas appear more dirty and unkempt. I wonder if this is because of society’s looser attitudes about dress, the effects of drug use, or because these men cleaned up to go to a mission? Also, we have more homeless families. 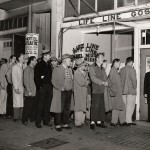 Pacific Lifeline recently published a hundred year history wirtten by Leroy Steinbrecker. He uncovered a lot of records relative to the San Francisco mission. I think it might be helpful in the book you’re writing. So, I’d be happy to lend you my copy of the book. Readers: I just came across an article in the Evangelical Visitor stating that the feeding program (pictured significantly above) was begun by the San Francisco/Life Line Mission on February 7, 1957. There’s more — too much to re-write here. It is interesting to see how Brethren in Christ thought about these types of programs typically undertaken by governmental social service agencies or (dare I say?) less evangelical Christian groups. The article, in full, appears in “Life Line Mission Starts Feeding Program,” Evangelical Visitor, April 22, 1957, p. 9. Avery was a great man. I had Avery as a resident for 3 years at Messiah Village. He would tell me stories about the Mission. The Life Line used to print a montly “newspaper” type article. He had save them all from when he was there and I got the chance to read them. It was amazing what Avery and his family (also including all the other people) did for the Life Line Ministry. He just recently entered Heaven last week but his work will continue on and will never be forgotten.